HABIT: Purple flowers in late summer, followed by short, deep purple seedpods. Tall climbing annual vine, planted from pretty black and white seed sin the spring. Fast growing and beautiful. 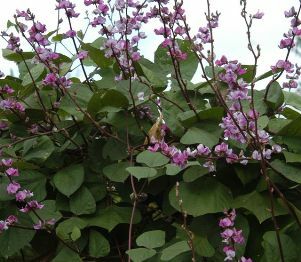 The Hyacinth Bean (Dolichos lablab, syn. 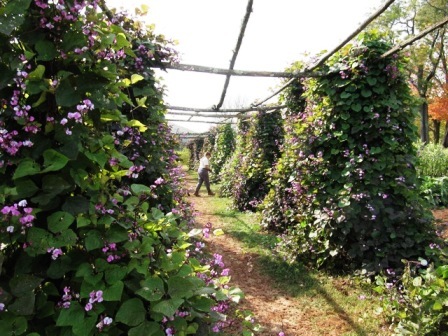 Lablab purpureus), also called Indian Bean and Egyptian Bean, is a plant of the family Fabaceae is a species of bean widespread as a food crop throughout the tropics, especially in Africa. It is also grown as forage and as an ornamental plant. CULTURE: Very easy to grow in most soils. 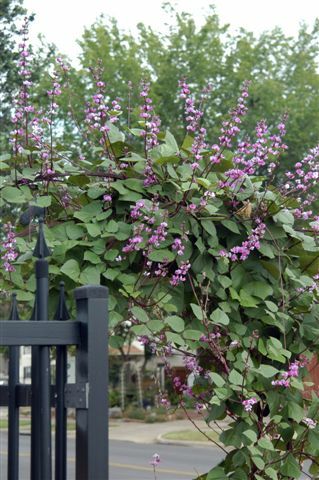 USES: Late summer color, shade for arbor or trellis. PROBLEMS: Black fuzzy caterpillars. Good news is that they grow up to be beautiful butterflies. NOTES: Name is now Lablab purpureus. Beans are edible but not very good to me. They should be cooked when very young and tender. 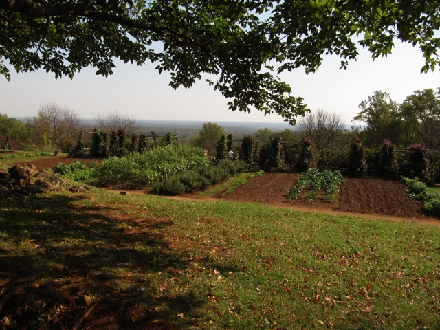 Read More: Thomas Jefferson, the Gardener.